Sophomore albums are always the most challenging for a band, especially when your debut album was named the winner of the Choice Music Prize for Irish Album of the Year. Do we go the familiar, but slightly creative path to grow as musicians and still keep our fanbase? Or the avant garde change-up to show everybody, “hey we can do this too!” Especially as your sound is very popular now (think Phoenix). Alex Trimble, Sam Halliday, and Kevin Baird chose the creative, familiar path with Beacon. 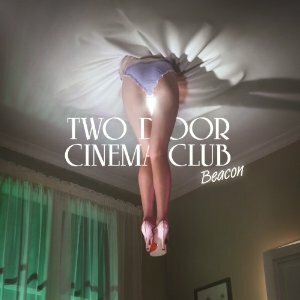 “Sleeps Alone” is the first single and exemplifies what Two Door Cinema Club does brilliantly — pop music with catchy hooks that makes us get up and dance around our living room while singing along. “Next Year” is the album’s opening track, starting off strong with electronic riffs and a surprising amount of lovely harmonies. With each listen, the album seems to flow smoother, keeping us interested in future releases. At the Olympics’ opening ceremony, Trimble sang “Caliban’s Dream.” It was certainly a sound we haven’t had too many glimpses of, that of ethereal frailty. Trimble has stated that Beacon, “takes us one step closer to the band we’ve dreamed of becoming.” To that we say, let’s see what next year brings to keep us dancing and singing.